In the previous post we laid the foundations for this short series. We went through a refresher of claims and OWIN and started building a simple ASP.NET MVC web project to investigate what’s available about the user of the current thread in a controller. We saw that by default the only claim available about a user might be their name, unless they are anonymous of course. In this post we’ll continue to explore claims of authenticated users. nameidentifier: this is the unique identifier of the user in the current system. Where is it coming from? The project saved the user in an SQL table. Below you’ll find a description how to find it. identityprovider: ASP.NET Identity is the successor of the well-know and by now outdated ASP.NET Membership provider. You can find more details about Identity here. As promised let’s see where to find the user name and user identifier claims. 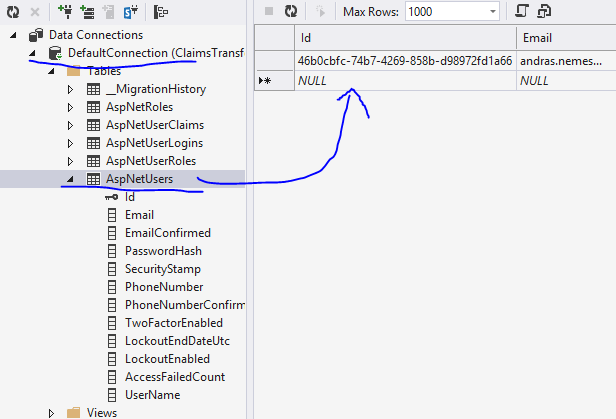 The default ASP.NET Identity mechanism will set up the user and membership related tables for you when the first user is registered. The tables look somewhat like the ones that the old Membership mechanism created but they are more streamlined now. The Id column will hold the name identifier claim. There’s also a UserName column all the way to the right which holds the name claim. A side note: if you’d like to know more about the new Identify framework in ASP.NET MVC5 I have an intro series on that topic starting here. 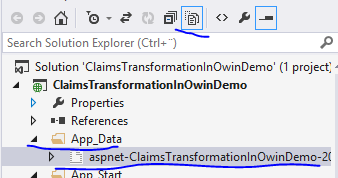 So now we know what kind of claims are available by default in an ASP.NET MVC5 project. It is possible that the above set of claims will be enough for you in your web project. However, most often than not you’ll want to dig further and find other types of claims in the database and/or suppress some of the existing ones. E.g. you might not need to know the identity provider claim. …variable. However, for educational purposes we’ll see how to achieve something similar manually. This process helps you understand claims and OWIN better. We first check whether the user ID is available among the initial claims. That indicates that the user is authenticated. If it’s not available then we simply return the incoming list of claims. Otherwise we add a couple of custom claims that we’re pretending to get from a data store. Those could in reality come from a web service, the Amazon file storage, MongoDb, what have you. Also, this is where you can remove some unnecessary claims from the incoming list. Here we simply keep the original list and extend it with some custom-made ones. So far so good. In the next post we’ll see how to convert this into an OWIN middleware. Nagyon szeretem a blogját, mert tömörek és aktuálisak a bejegyzései. Köszönöm szépen és további jó munkát kívánok Önnek. Köszönöm kedves szavait, és örülök, hogy szereti olvasni a blogomat.